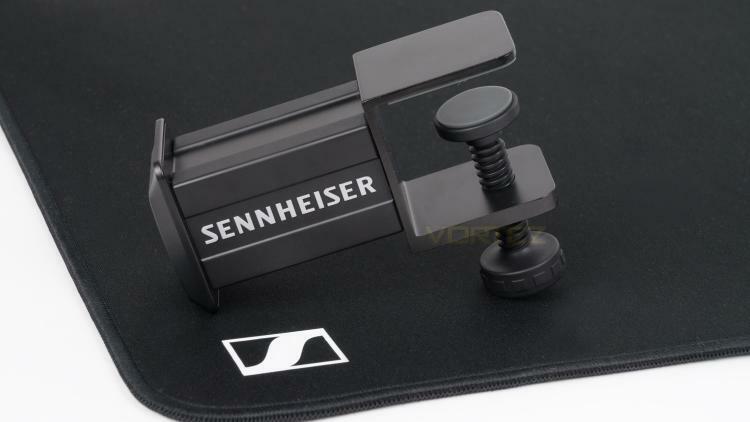 Sennheiser is mostly known for their audio products and solutions, but did you know they also made mouse pads and headphone hangers? Well, neither did we until recently and today we’ll be taking a look at both. 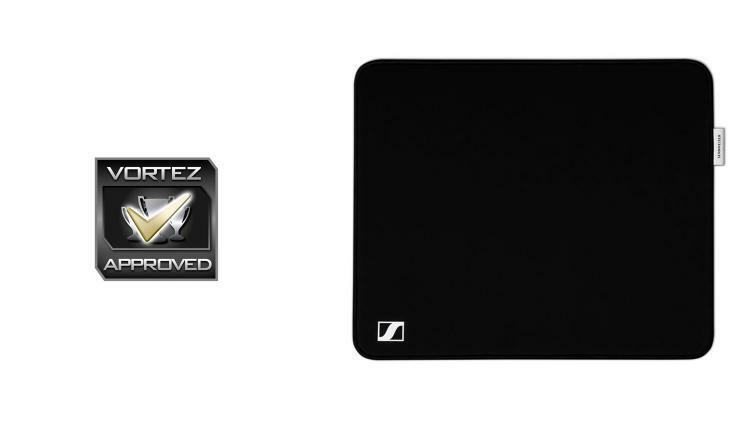 The mouse pad (GSA 13, 15, 17) can be bought right now from Sennheiser directly and is available in three different sizes. The GSA 13 (Small) comes in at 29 x 35cm, the GSA 15 (Large) measures in at 40 x 47cm and the GSA 17 (XL) is 32 x 92cm. However, if you’re in the market for a new headset or amplifier, Sennheiser is currently running an offer where you can get one of the mouse pads with any of the listed. These include. The GSA 50 headset hanger dimensions are 12.5cm (L) x 7.5cm (H) x 4.4cm (W) and its made from a combination of glass-reinforced plastic (GRP) and aluminium. The design of the GSA 50 is basic yet highly functional as it utilises a tried and tested method of attaching to your desk. This is great as there is no adhesive involved which means it's removable and also won’t damage the surface of your desk. 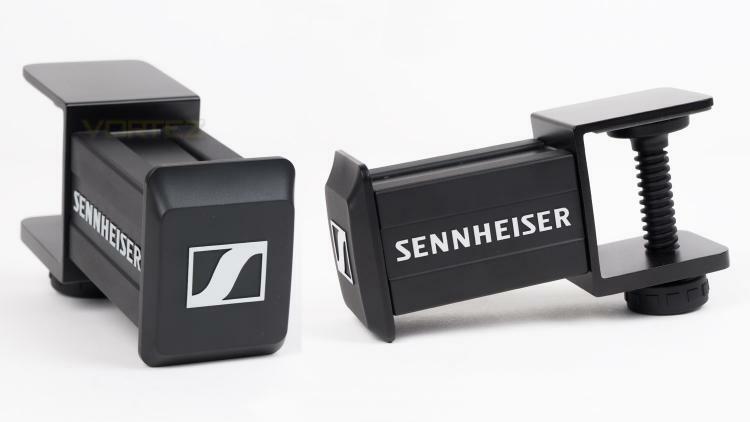 So, we know Sennheiser make great audio products, but how are their accessories? Let’s find out. Taking a look at the GSA 15 first and it looks like most other mouse mats at this price point. The colouring is all black with no extra bright flourishes. 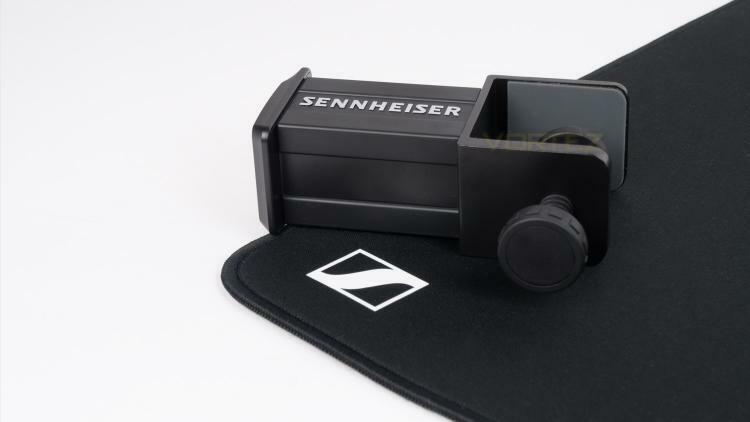 In terms of design elements, there is a small white Sennheiser logo in the bottom left corner and a small tag on the right-hand side near the top corner. This just adds a nice classy touch without being over the top. The underside is rubberised though the texture is not overly grippy as with some other mouse pads. The front of the GSA 50 resembles the shape of their sliding mechanism found on the Urbanite series of headphones; it also features a prominent Sennheiser logo. 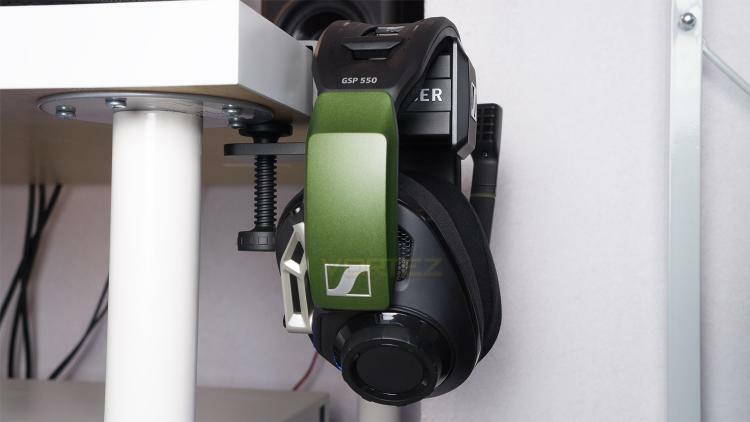 The side features some Sennheiser branding that is fashioned in a similar style to the logo on the front. The clamping mechanism is old school in its design, but it's highly effective and gets the job done. You can also see that the inside is rubberised to prevent damage to your desk surfaces. When placed at the side of your desk it does stick out quite far (approximately 8cm), so keep this mind so you don’t bump yourself on it. The GSA 15 is a decent mouse mat, though it's not perfect. The top (main) surface is relatively smooth, and good quality. This means the tracking quite adept, and it's also pretty solid for precision too. Though it's not the smoothest out there the slight resistive feel to it does help when trying to be accurate, yet it does somewhat suffer when it comes to rapid movement. This makes the surface better for slower paced titles than fast FPS shooters. The underside is not heavily textured like some offerings, nevertheless, it does grip surprisingly well and manages to stay quite planted when in use. Though not as cemented as some, the GSA 15 did fare very well when under pressure. As for the way it's put together, it doesn’t feel as premium as the price point would suggest. When compared to the cheaper Fnatic FOCUS 2, it's not as durable feeling as it feels quite thin and a little frail. The bordering stitching is very good though, so it does claw back some points there. It just doesn’t possess that Sennheiser quality that they are known for. When looking at the GSA 50, it's the exact opposite, and it does have that quality to it. This is achieved with its solid construction throughout. The majority of the construction is metal - aluminium to be exact and also a high-grade glass-reinforced plastic, this combo makes it feel very sturdy and robust. 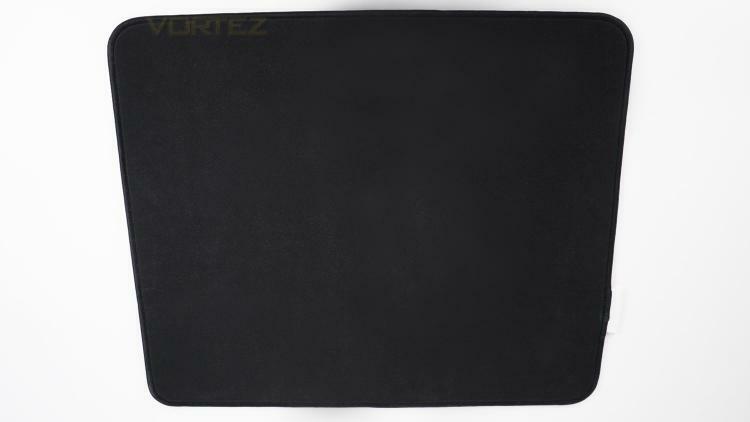 When placed on a desk it utilises two rubber pads to prevent the surface from getting damaged. This works very well and even after removal, we didn’t note any damage to the surface at all. It's also worth noting that the maximum desk thickness for the mechanism to clamp to is 3.4cm, so be sure to measure yours beforehand. In-use it worked great as there was easily enough space to fit the Sennheiser GSP 550 which has a really thick headband. Speaking of space, there is approximately 6cm to fit your headsets headband, so again be sure to make the relevant measurements before any purchase. Using GSA 50 daily was very good, placing and removing a headset was really easy and the headset felt very secure when placed on it. As is, there is no dedicated cable management, though you could wrap the cable around near the mechanism or if there is space, behind the headsets headband. We would have liked to have seen some form of cable management as standard, especially for those larger headsets and the styles of headphones that utilise a longer cable. 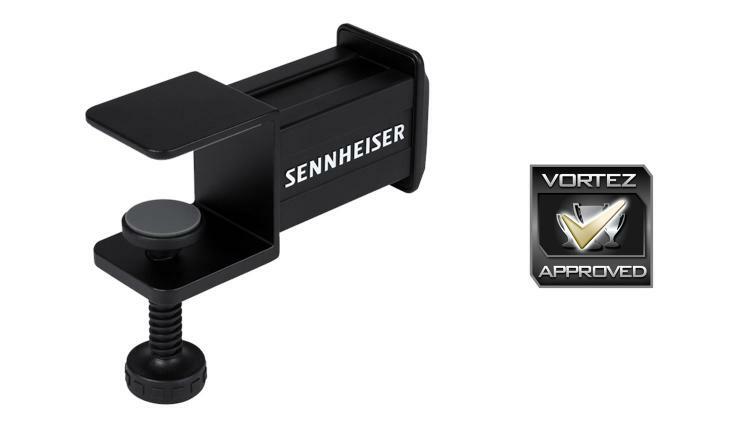 So, do Sennheiser’s accessories live up to their standards? Well, on one count, yes and on the other, it's a yes, but not a resounding yes. 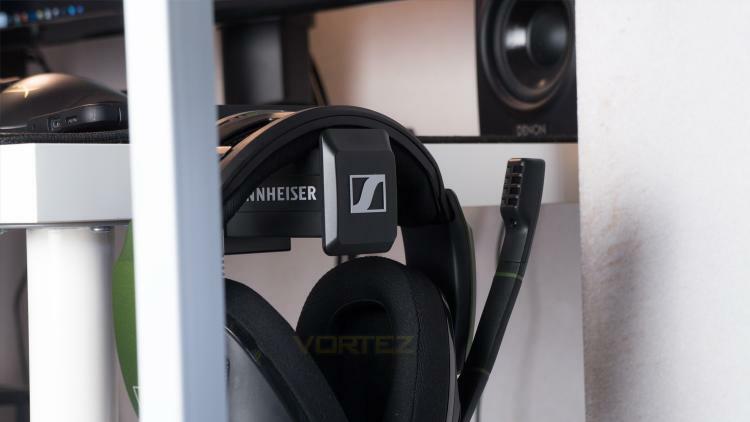 The GSA 50 headphone hanger is a brilliant product, the design fits with what you’d expect from Sennheiser as its minimal, yet not bland and it won’t look out of place in a gamers setup or a productivity-based one. The build quality is also top notch as its made from high-quality aluminium and glass-reinforced plastic. The in-use experience is also great as though the clamping mechanism is basic, it works very well and has the bonus of not damaging your desk thanks to some well-placed rubber pads. Another plus is that there is no adhesive meaning it's not permanent and can be moved very easily. Also, the GSA 50 is spacious and can accommodate a large set of headphones no problem at all. One area it does fall down is with cable management, as is, there is no dedicated solution, and you are left to figure out how to best manage your cable. This isn’t a deal breaker as there are ways you can do it, but those ways aren’t exactly ideal. Of course, you may use a wireless headset so this won’t be an issue, but for those that don’t, then you’ll have to get a bit creative to keep the cable nice and tidy. One other thing that needs addressing is the price, coming in at £30.99 in the UK ($38.10 US / $54.95 AUS) it’s not what you’d call cheap, but the GSA 50 does get a lot of things right which helps justify the price tag. Now to the GSA 15 and this is a tougher sell as there are a lot of mouse pads out there that do what this does. The plus points of the GSA 15 are the classy styling, the smooth yet precise surface and in-use experience. 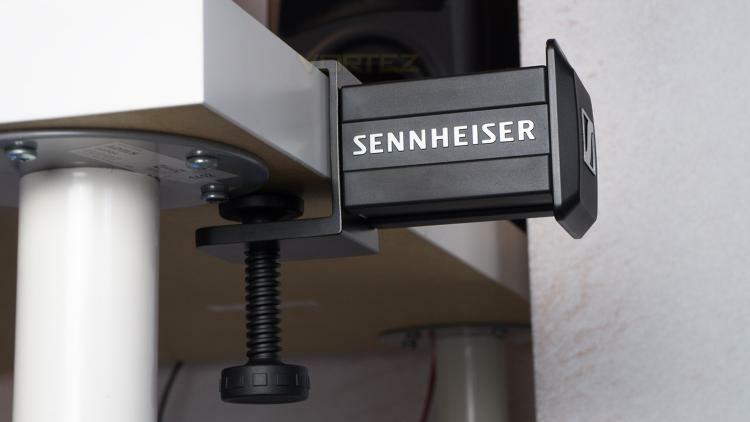 We like that Sennheiser has kept things clean meaning that this wouldn’t look out of place in any setup. The surface is also impressive as its smooth - so that your mouse glides nicely and it also precise, which makes it pretty good for a set genre of games. The downside to the surface though is speed as it's not the quickest we’ve ever used meaning for the fast-paced titles it's not the best. Where the GSA 15 does fair better is with productivity as the precise surface is great for photo work and video editing. The one downside to the GSA 15 is the quality feel of it - especially given the £26.99 ($29.95 US / $49.95 AUS) price tag, as it just doesn’t feel as well made as some other pads in this price range. The stitching is nice quality, it’s just the mouse pad as a whole feels slightly flimsy. Both the GSA 50 and GSA 15 would make nice additions to any setup. The GSA 50 works well in both gaming and productivity use cases whereas the GSA 15 is fairly capable at gaming, and even better when it comes to getting some work done. 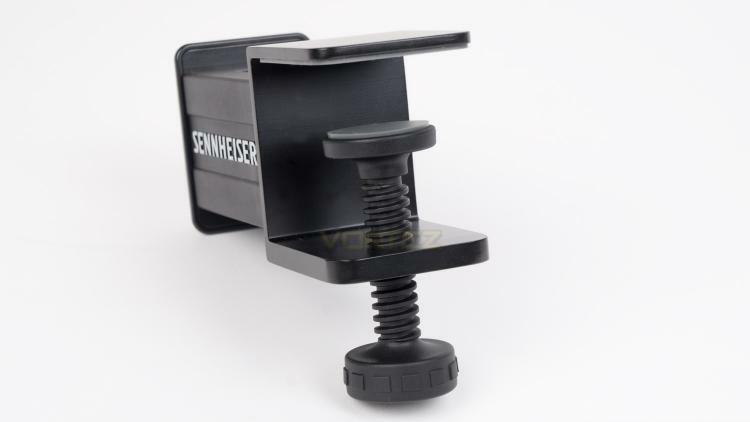 The Sennheiser GSA 50 is very solid premium headphone hanger that just gets the job done. 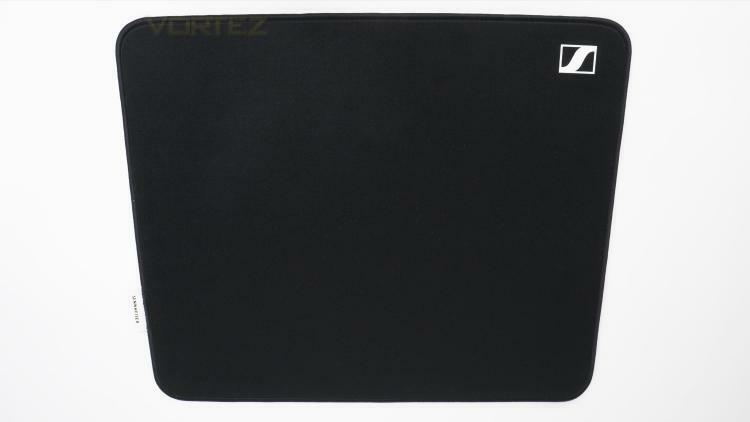 Sennheiser’s GSA 15 mouse pad, may not be the cream of the crop, but it certainly will add a touch of class to your setup.